If you have a heavy duty requirement such as a busy pub, restaurant, school, college, university, or hospital, then the Sharp R-24AT extra heavy duty commercial microwave oven is what you need. It is designed for these large establishments which need a reliable and powerful microwave oven. It has twenty pre-programmable menus and a stackable design. 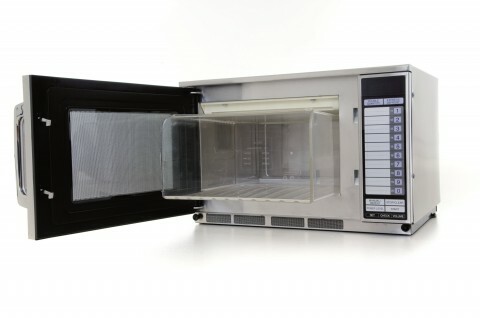 Microwave output is 1900W and it contains Sharp’s feature express defrost and counter check options. The Microsave Cavity Liner saves you time and money by protecting the interior of your commercial microwave oven from spills and burnt food particles; reducing the chance of damage and increasing hygiene. NSF Approved cavity liner keeping the cavity clean as well as helping to avoid costly repairs and downtime.